This is, by far, one of my favorites of this sale. It has that classic look – as did most of the vehicles produced by White, Autocar and Diamond T. That slanted front where a radiator would usually be. And whatever that thing is hanging off the front. Classic. 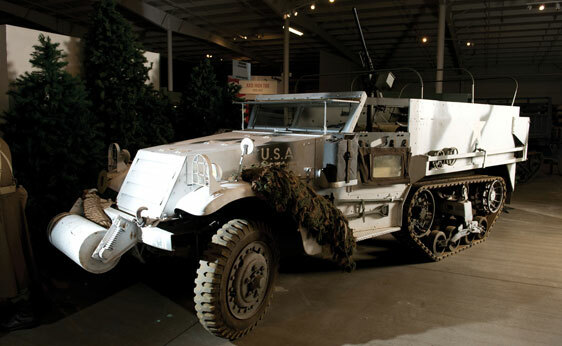 About 12,000 of these were built for the U.S. war effort (about 41,000 half-tracks were built in total of all kinds for the U.S.). This one has a 148 horsepower 6.3-liter straight-six. It’s quick too, capable of 40 mph. More here. This entry was posted in Uncategorized and tagged 1941, auctions, auctions america, autocar, half-track, m3, military vehicles, trucks, wwii by classiccarweekly. Bookmark the permalink.